Isla Fisher is an Oman-born Australian actress of Scottish descent who broke into the Hollywood movie industry by first appearing in Scooby-Doo (2002) before going on to star in films like Wedding Crashers (2005), Confessions of a Shopaholic (2009), and Now You See Me (2013). Fisher, who has also authored a number of novels, is known for her charitable work. She has in the past donated significant amounts of money to help Syrian refugees, while also giving out a portion of her signed shoes for the Small Steps Project Celebrity Shoe Auction. Fisher was born Isla Lang Fisher, one of five children to Elspeth Reid and Brian Fisher, on the 3rd of February 1976 in Muscat, Oman. Her mother is a novelist while her father works as a banker. When Fisher was born, her parents, who are originally from Scotland, were living in Oman due to her fathers work with the United Nations at the time. Before moving to Australia when their daughter was six years old, the Fisher family spent some time in their hometown of Bathgate, Scotland. In Perth, Australia, Fisher learned to explore her surroundings and became a very outdoorsy person. She went on to attend Swanbourne Primary School and then the all-girls boarding school, Methodist Ladies’ College. It was here that Isla Fisher took up acting and was cast in led roles for a number of school productions, such as the horror-comedy musical Little Shop of Horrors. She had in the meantime also been appearing in a number of Australian television commercials. In 1993, at just 17 years of age, Isla Fisher landed her first two professional acting gig, appearing as a guest star in the children shows; Bay City and Paradise Beach. She had also taken up writing as something to fall back on if her acting career did not pan out as she hoped. With the help of her novelist mother, she published two novels meant for a teenage audience titled Bewitched and Seduced by Fame. In 1994, Fisher was cast to play Shannon Reed in the soap opera Home and Away which earned her two Logie Awards nominations; Most Popular New Talent in 1995 and Most Popular Actress in 1997. When she turned 21, she left the show to enroll at the French theater school; L’École Internationale de Théâtre Jacques Lecoq in Paris, where she studied clown, mime and commedia dell’arte, a type of Italian comedy. After a brief period of mastering her craft, Fisher began to work again, first in theaters; appearing in the musical comedy Pantomime and Cosi in the United Kingdom before doing the German movie Swimming Pool (2001) and then transitioning to Hollywood. 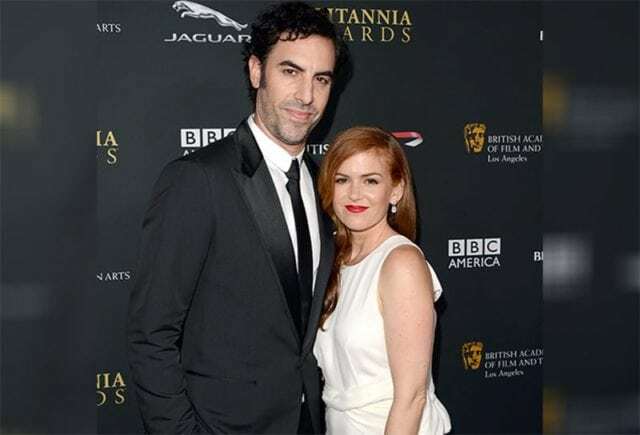 Isla Fisher is married to English actor and comedian Sacha Baron Cohen who is best known for starring in the comedy ‘Borat’ (2006). The duo first met each other at a party in Sydney, Australia, in 2002 after which they kept in touch and began dating. In 2004, the duo got engaged but had to wait till 2010 before they were able to exchange vows because Fisher had to complete a three-year study program to convert to her intended husband’s religion; Judaism. After completing the conversion, Fisher took up the Hebrew name of Ayala and married her man in a Jewish ceremony in Paris, France. The union has produced three children; daughters Olive, born in 2007 and Elula, born in 2011, and then a son named Montgomery, born in 2015. Isla Fisher has four siblings, of which none are as famous as she is. It is unclear if actor/assistant director Conor Reid, who has been listed on IMDb as Fisher’s step-brother, is indeed one of her four siblings. Another famous person who has been mistaken to be related to the The Great Gatsby (2013) actress is her colleague Jenna Fischer who is best known for playing Pam Beesly in The Office (2005–2013). The duo share a homonymous surname and have a striking resemblance with each other.